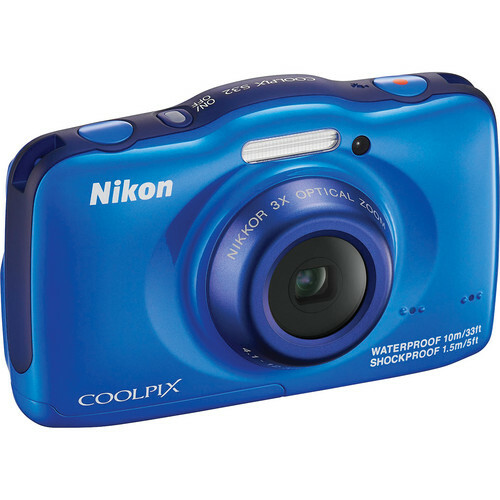 The blue COOLPIX S32 Digital Camera from Nikon is a point-and-shoot camera with a 13.2MP CMOS image sensor. It's equipped with a 2.7" TFT LCD screen with an anti-reflective coating and 5-level brightness adjustment. The 3x NIKKOR zoom lens has an effective focal length of 4.1-12.3mm, which is equivalent to 30-90mm in 35mm format, with an f/3.3-5.9 aperture range. For added focal length, a 4x digital zoom gets you to approximately 360mm. Record HD 1080p video with stereo sound, and when you're ready to share your creations, just connect the COOLPIX S32 to an HDTV with an optional cable. The camera is waterproof to 33', shockproof to 5', and dustproof. For maximum point-and-shoot convenience, select the Easy Auto Mode, and let the camera do the thinking so you can simply focus on getting the shot you want. Electronic Vibration Reduction helps improve your videos by removing unwanted camera shake. Waterproof to 33' for up to 60 min, shockproof to 5', and dustproof. Camera is rated equivalent to IEC/JIS waterproof grade 8 (IPX-8) and IEC/JIS dustproof grade 6 (IPX-6). Electronic Vibration Reduction helps compensate for camera movement to keep your videos blur-and shake-free, even when your hands are unsteady. When your subject is moving fast, Motion Detection automatically kicks in and selects a faster shutter speed and higher ISO to help you get sharper, clearer photos. Easily apply creative Image Effects like fisheye, toy camera, cartoon and more, in-camera, without the need for additional photo or video-editing software. The Smart Portrait System activates several features ideal for portraits, like Face Priority AF, Skin Softening, Smile Timer and more. The S32 uses contrast-detect AF, allowing you to choose between a center focus area, or face detection. You can copy photos, rotate them, or choose the Small Picture feature, which creates a smaller image that is ideal for emailing or sharing on social networks. Box Dimensions (LxWxH) 5.5 x 5.3 x 3.6"
COOLPIX S32 Digital Camera (Blue) is rated 4.5 out of 5 by 11. Rated 4 out of 5 by RobFuz from Simple Simple, Easy camera to use by the pool and at the beach. Images look pretty good and video looks pretty good as well. I had fun taking video of my son jumping in the pool with the camera following him underwater, a very cool effect. I also liked taking pictures in the pool with the water drops frozen in mid air. It seemed a little slow, but I did use an ULTRA Class 4 SanDisk card and will try a faster card next time! The interface is basic and a little confusing until you get used to it. It has some silly features, like you can make the camera bark like a dog instead of a shutter noise.For the price I recommend this FUN camera! For use on vacation or for your kids.3 things to keep in mind. - This camera CAN SINK in a pool or the ocean, I advise purchasing a floatable strap.- You have to charge the battery in the camera, I suggest an external charger.- Battery life so far seems just average, I suggest buying a second battery. Rated 4 out of 5 by ivonneak from Great for kids This is a fun an inexpensive camera which takes decent pictures and is pretty rugged. I would definitely recommend this camera for families with young children the fun effects life bubble and borders make it a lot of fun.Battery life was pretty good and image quality is great for the price. Video is sharp and clear. Rated 4 out of 5 by Anonymous from Great little P&S for the price I use the camera for working at power plants and the water/dust/shock resistant qualities are REQUIRED and are holding up well. IQ is very good for an inexpensive point and shoot. Controls are very simple and user friendly. Rated 5 out of 5 by davidkath from Exceeded expectations I just took this camera scuba diving in St Thomas. It performed perfectly and was easy to use. The photos and video clips came out great. I unintentionally took it below 33 feet and it didn't leak. Rated 4 out of 5 by Anonymous from New Nikon camera Good basic point and shoot that is safe down to 30'. I purchased this camera to be able to still take photos on trips on rainy days. It will fill the bill and the price was right. Rated 4 out of 5 by Carohsu from I would recommend this product I used it on the beach and everything worked perfectly. It exceeded my expectations. I have really made a good choice. Rated 5 out of 5 by uwsphoto from perfect for a child I gave this camera to my grand daughter who turned 6. She has been delighting in using a more sophisticated camera (my Fuji X E2) and making fine images with that. Now she has her own, it makes great images, and it is fairly child-proof. And it is hers. All at an attractive price. Rated 5 out of 5 by RebeccaVaneth from Good product Cheap but good product but i just have trouble on focusing landscape scenery but the macro is amazing! what is the Battery life of the Nikon - EN-EL19 Lithium-Ion Battery. how many hours and how many times can you recharge? Battery life is not great. Overall not a good camera.